This knitted shawl pattern is designed by Kat Goldin of Slugs On The Refrigerator, exclusively for The Knitting Network. The pattern will be released in three instalments along with our usual weekly blog with helpful tips - this time from the designer herself! For this KAL you will need Erika Knight Studio Linen (85% recycled rayon, 15% linen). 2 x 50g (120m) hanks of Erika Knight Studio Linen (85% recycled rayon linen, 15% linen) in Neo (404) and 1 hank in Bone (401). You will need one pair of 4.5mm knitting needles and a cable needle. We are very excited to be working with Kat. We've been big fans ever since her Slugs On The Refrigerator blog first launched. 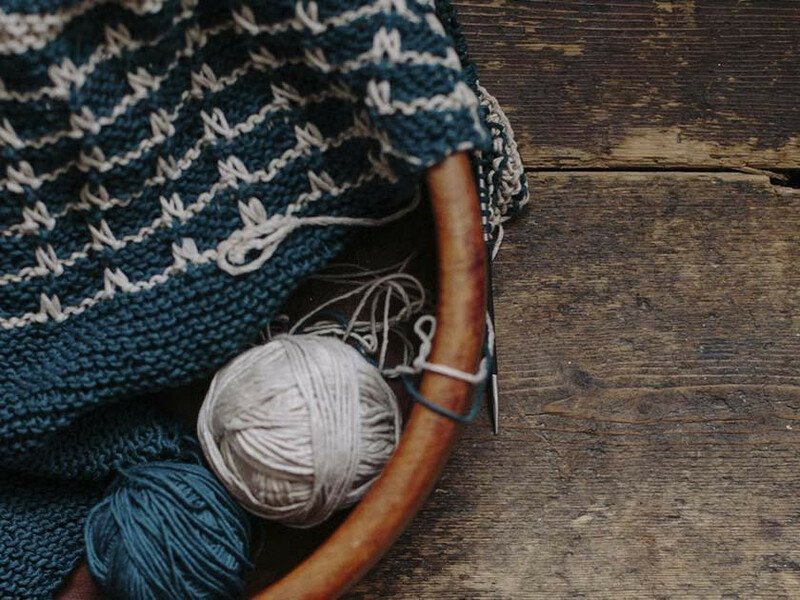 Kat's stunning photography - which she does herself - is matched only by her eye for designing knits which perfectly capture a theme. Kat was keen to tell us a little bit about her inspiration. Well this is certainly an iconic painting that we're sure a lot of followers will recognise and we're super excited to see how this will unravel over the coming weeks. It's not just this image of an ocean wave that Kat likes, it's the real thing too. 'I was in my mid-twenties before I saw the ocean. I’d grown up in the middle of the USA, a place called Lisbon, Iowa, that was just about as far away from the coasts as you can get,' she recalls. 'I’d flown over oceans, travelling to Europe, India and Thailand, but had never stood at the shore, played on the beach or swum in the sea until I moved to Britain. I remember standing on the cobbled shore and thinking that I’d never seen anything so incredible in my life. It was love at first sight. 'Since that first meeting almost 20 years ago, I have periodically had to pack up my husband (and subsequently 3 children and two dogs) to make pilgrimages to the sea, needing to get my fix before I return to my largely land-locked life. We can almost smell the sea air! How about you? We are moving all of our KALs, CALs, offers and more onto our Facebook page. We will be inviting you to these exclusive events so you can join in all the ones that you want to. Even if you just want to spectate! Though of course we'd love for you to join in. So remember to like the page so we can send you invites, and we look forward to seeing you there for our first ever KAL and beyond!